It’s fun to stay at the… | Comics I Don't Understand - This site is now being updated daily at http://www.comicsidontunderstand.com. Please change your bookmark if necessary, and notify any web site with a link to the old address. I have no idea where this is from, but for some reason it cracks me up. That is so wrong and so funny. 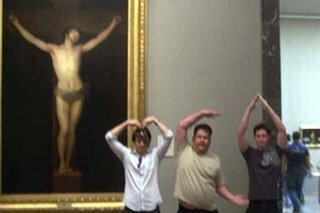 I’m so glad I’m already going to hell — I can laugh at this without worrying. I laughed at this, but I hope God has a good enough sense of humor to know why I laughed. You know, being omniscient and all.